Send this delicious and beautifully presented basket to those you wish to impress or congratulate. Your choice of two well-regarded wines or one bottle of distinctive champagne is nestled in a traditional basket filled with an array of delicious foods guaranteed to be please. 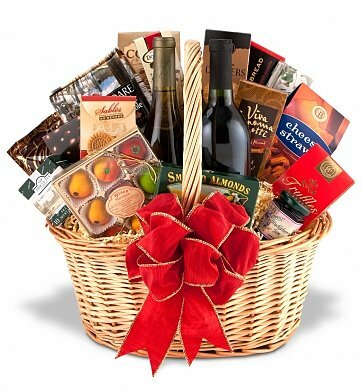 Imagine the delight of the recipient to discover not only the wine, but a basket filled with a variety of specialty foods such as crackers, cheese, dips, cookies, candies, teas, or coffees. When only the finest is required, this wine basket is a perfect choice. Your choice of Champagne, Red & White Wine, or Two Bottles of Each. Premium Wine and Gourmet Basket is a hand delivered gift. These gifts are delivered by one of our local design centers located throughout the United States and Canada. Same day delivery is available for most gifts when ordered before the cutoff time. The cutoff time for Premium Wine and Gourmet Basket is 1 PM in the recipient's time zone. I was happy to be able to have wine delivered as a gift, and the individual who took my order was very pleasant. However, when the basket arrived it contained just one bottle of wine, rather than two. Customer service quickly and pleasantly corrected the problem, no questions asked, and a bottle was delivered the very next day. I would definitely order from this company again. Love the wine selection! We are wine lovers! Delivery was on time and package looked fabulous! I did not get to see the gift basket, but my sister said it was beautiful and everything in it delicious - especially the chocolate. The delivery was made on the same day I ordered it - amazing! Thank you!